We started travel blogging only a few months ago, yet we are happy to announce already that bloggers all over the world have been inspired by our travel posts, our travel tips and our rich travel content for which we feel really proud and decided to encourage us to write more by nominating us for the Sunshine Blogger Award!!! This post is to celebrate this nomination, its our way to thank felow travel blog Itsalltriptome for nominating us and of course its a post that aims to encourage bloggers do their best and document their experiences in a way that is inspiring to the readers!!! So first of all thank you Itsalltriptome! We share your passion for travel and our vibes meet your aim of inspirning other to travel too! 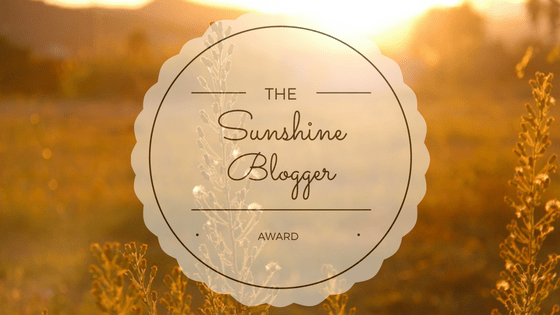 The Sunshine Blogger Award is given from bloggers to fellow bloggers who inspire creativity and positivity and who bring sunshine to the blogging community and to their readerships alike. It is a way of encouraging one another as in saying “Hey, you are doing a great job and we can see it. Keep it up!”. Now you know why we feel so happy to have received this award. Who is the person who inspired you the most and helped you decide to start your own blog? As a couple that loves travelling we find inspiration in each other whether its for starting a blog together or making hard life decisions! If you should stop travelling for some reason, which is the one country you would like to spend the rest of your life in? This one is easy! We would love to live in a small Greek island, like Anafi! How do you spend your time during flights/train journeys etc? Olga… always sleeping! Dimosthenis… always reading! Which is the one thing about blogging you hate the most? When you find out that your exact words are being used somewhere without mentioning! Bad copies! What is your favourite thing about blogging? That is a perfect way to express yourself and ideas to the whole planet! What do you usually buy as souvenirs from the places you visit? We like all kind of souvenirs, especially the eaten ones and little miniatures! Is there something you always take with you in your travels? Olga… earplugs and spleep mask! Dimosthenis… book! What is your best tip for packing light? Ha, you have to read our post about light travel! Road trip or scenic train ride? Xmmm, thats a tough one! Olga… train! Dimosthenis… road trip! Is it important for you to taste a destination’s local food/wine etc? Its a MUST! You must try local food in order to taste its culture! Do you send postcards to your loved ones while travelling? Unfortunatelly not any more! But we always try to keep informed our friends and family for our daily travelling experiences! What would be your ultimate goal to achieve by being a blogger? Do you enjoy being a blogger? Why? What would you say is the most amazing fact about your blog? What is the most amazing fact about yourself that you would like to share with you readers? What is your favourite travel blog? 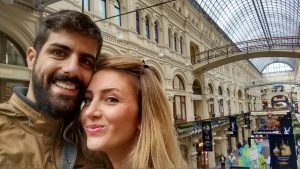 What do you expect of a travel blog the most? Destinations or travel tips? What is your travel style? Couples, solo, backpacker, luxury traveller etc? Can you share a blogger’s «DO» advice, with your readers? Can you share a «DON’T» advice too? Would you like to share with us your blog’s moto? We hope you enjoyed the post as much as us and maybe you have identified yourself by answering with us to the questions. Lets get in touch and stay connected for more interesting posts, guest posts and content ideas! Feel free to subscribe to our newsletter for more travel inspiration!